Traceability from farm to plate is important to consumers, which means it's important to retailers and packers, and ultimately, producers. In 2013, delegates at the Pork Industry Forum passed a resolution to develop a common on-farm audit. By 2014 a task force was formed and an audit was developed. On-farm beta testing took place last year, and educational materials for training were produced. In a recent SowBridge session, Dr. Monique D. Pairis- Garcia, with the department of animal science at The Ohio State University, provided details on the Common Swine Industry Audit, which officially began on Jan. 1 this year. Testing has been meticulous and comprehensive. Pairis- Garcia said packers, producers and industry stakeholders wanted the audit to be: consistent, workable, reliable, verifiable, credible and affordable. Food service and retail companies also wanted an on-farm animal well-being program to include independent, third-party auditors. "One of the goals was to demonstrate the importance of having an audit," Pairis-Garcia said. "Third party auditing is widespread across many businesses. When we talk about maintaining the trust of the consumer, this brings credibility and transparency." Dr. Chris Rademacher, extension swine veterinarian at Iowa State University, served on the subcommittee that helped develop the training for the third-party auditors. He acknowledged Sherrie Webb with the National Pork Board and the major packers for their assistance and cooperation when he spoke about the audit recently. He said, "Multiple audit standards had created an extraordinary administrative burden on pork producers, particularly to those who sold pigs to multiple packers. 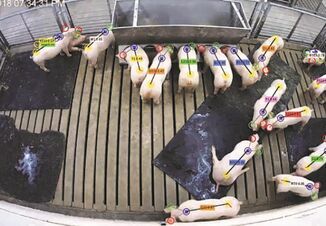 This program would allow pork producers, packers and processors to utilize one standardized audit tool, rather than having each packer creating their own audit standards on animal welfare and pre-harvest pork safety." The Common Swine Industry Audit is designed to make key measurements and recommendations to evaluate welfare on-farm. 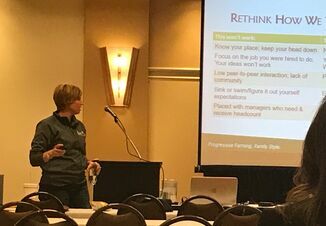 Pairis-Garcia explained the difference between the industry's PQA Plus program and the swine industry audit is that PQA Plus is completely voluntary and focused on providing educational resources to producers. On the other hand, an industry audit is performed by a third party and is a verification of the standards. "We're creating standards based on what the science says, what is realistic, and what the core values of stakeholders are," she said. "We have to know what the McDonald's and Wendy's want and make sure it's included in the three components of the audit." Rademacher said the Professional Animal Auditor Certification Organization (PAACO) will train independent, thirdparty auditors to do the audits of sites selected at random by the packer. 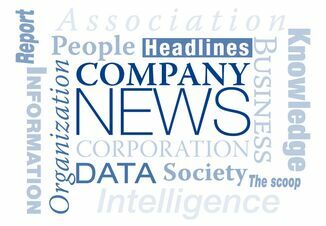 "The primary reason for this was to create a standardized set of criteria for each question that the auditors could follow, in an attempt to minimize auditor-to-auditor variation," he said. "A key understanding is that the auditors work for the packer who commissioned them to come to the site and perform the Common Swine Industry Audit. The results will go back to the packer and the producer will get a copy." Auditors must pass a swine proficiency test prior to starting the CSIA auditor three-day training. The training teaches auditors how to assess each question on the audit. The three components evaluated in the audit are related to animal-based, resource-based and protocol-based measures. Animal-based: These measures allow for variation in system design and management. Pairis-Garcia said, "A disadvantage is that existing welfare issues have already occurred, so I can only help decrease them in the future. These are the most direct indicator of animal welfare, regardless of system design." The measures include lameness, body condition, animal handling, euthanasia and more. Resource-based: These measures are air quality, emergency back-up ventilation, euthanasia equipment, facilities, penning, flooring, chutes, alleyways, feeders, waterers and animal cleanliness. Protocol-based: Protocol-based measures are things like standard operating procedures (which must be accessible on the farm), written euthanasia plans, piglet processing protocols, daily observations, caretaker training and more. "This is by far the area in which we lose a lot of points," Pairis-Garcia said. "SOPs need to be written out and the audit clearly explains what needs to be written out." Resource- and protocol-based measures identify potential causes of poor animal welfare, but a disadvantage is that they are indirect indicators of animal welfare. The Common Swine Industry Audit has 27 key aspects of swine care and pre-harvest food safety and it includes all phases of production. Focus areas include: critical criteria, animals, caretakers, records/documentation, facilities, transportation and pre-harvest food safety. Pairis-Garcia said, "All of these principles are based off of PQA Plus, so producers who have taken [PQA Plus] seriously will find similar protocols in the audit. "It's a little different depending on whether you have a wean-to-finish unit or a sow unit," she added. "About 50% of all measures are for animal-based measures, which is the most valid way to determine if you're meeting the protocols. Records do definitely play a role for the most part, we're looking at the animals when we get on the farm." Rademacher said it was important to note that even though the breadth of items to be measured has vastly increased from a score standpoint, 50% of the total points are still based on animal assessments. "One of the primary differences is that this is an audit and not an assessment, meaning there are scores assigned to each question in an effort to quantify the status of animal welfare and animal care practices employed on the site," Rademacher said. "There also are five questions on the audit that, if failed, would result in an automatic failure of the audit. These five questions are critical animal welfare questions dealing with animal abuse, timely euthanasia, and confirming insensibility and death for euthanized animals." Facilities are tied in with transportation, to make sure chutes and alleyways are clear. Most auditors will break down each area of the audit as a point and as a percentage, said Pairis-Garcia. "If an auditor sees a willful act of abuse, that is a critical failure, and some auditors will stop the audit at that point and leave the farm," she said. "The same is true of humane euthanasia - that also is a critical failure." Producers who have a major non-conformance or critical failure are given 10 days to correct it. Pairis-Garcia told SowBridge participants she hasn't been on a farm yet that has had a perfect score on facilities.